This book is written in a classic setting. A senior police officer and a young policeman are working together on a recent case. The difference with this book and other detectives I have read is though, that this story takes place in a setting of a high school with special attention for children who are in need of that. More or less it is quite the classic version but it touches because it has a lot to do with children. Halfway the book I discovered that I could guess who was guilty of the crime that was committed. Towards the end I thought I had to change my suspected criminal. But the plot twist…well I still do not know what to think of that. It did and it did not surprise me. In the book I have found a few minor spelling mistakes but overall it was oke written. The book is in the category of fiction for adults but in my opinion it also really suits for young adults. The sentences are short and therefore the book reads quick and the events follow each other up quickly. Overall it is oke. There are many characters in the book. The main character is police officer Job Kramer and his colleague Pascal van Deursen. 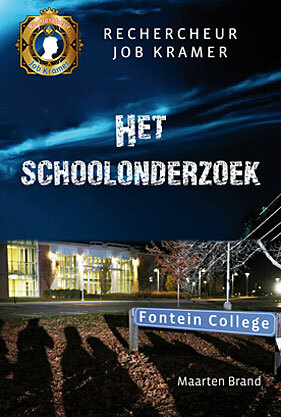 Other names that occur in the book are Kars van Ewijk, Marnix Chavez, Ivo Chavez, Pieter Hansen, Bas Hansen, Lize Hansen, Floris van Trigt, Reimer, Andrei Stoppelbergen, Stef de Langeboom, Tineke van Sprangen, Natasja van de Weert, Boaz Golstyn, Fred Breur, Arie, Xander, Mathijs, Güniz, Lizzy, Kim and Mariët. I hope you like the book too. It is oke to read it! I am not telling about the story too much– never do in my book reviews – you have to read the book yourself and make your own opinion.